'Make Ringtones on your Mac' gives you everything you need to create your own custom iPhone ringtones plus over 300 for you to use right away - the ultimate iPhone upgrade! Want your iPhone to stand out from the crowd? Want over 300 new ready-to-use ringtones or even to create your own? Want to give all your contacts their own unique ringtone? If so 'Make Ringtones on your Mac' is for you! Whether you are a budding pop star or completely tone deaf, with the help of AMG's producers you'll be making ringtones that impress your friends and make your iPhone truly unique within minutes. If you want to create your own custom ringtones why not choose from the hundreds of included 'multitrack' ringtones and then customise them to your requirements. Add your own keyboard chops, vocals or a rap, remix or even your own guitar part. Make sure your ringtone is exactly as you want it - the only limit is your imagination. If you just want new ringtones for your iPhone FAST! If you just want hundreds of hot, new ringtones ASAP then look no further. Simply drag and drop the 300+ ringtones into iTunes, audition, select and sync with your iPhone as usual. Why settle for one ringtone when you can give each of your friends their own ringtone so you know who's calling the moment your phone rings? Want to take it to the next stage and build your own ringtones? The most adventurous users can select from the hundreds of high quality loops from the AMG vaults included here and build them from the ground up and take complete control. 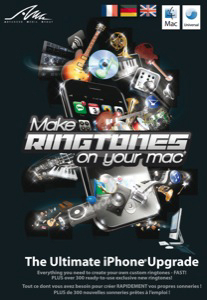 'Make Ringtones on your Mac' gives you three ways to transform your iPhone's ringtones whatever your musical talent. You'll achieve great results whether you have a musical bone in your body or not.